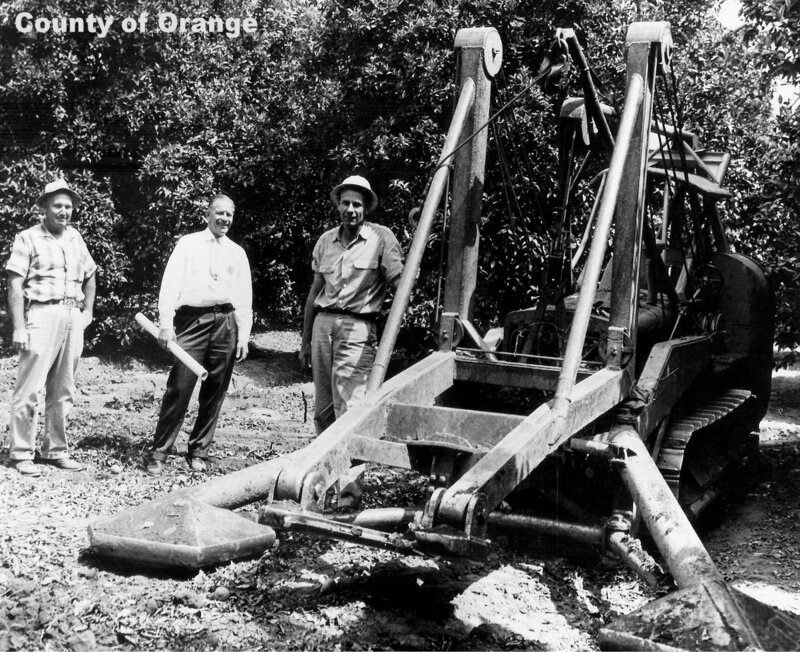 Along with the Post Brothers plow and the Carroll Beet Dump, Weldon Field’s stump remover is one of the most historically significant pieces of heavy agricultural equipment in Orange County’s history. This custom-built tree-removing machine fell off everyone’s radar screen for a few decades, but perhaps at least a small version of it has resurfaced. 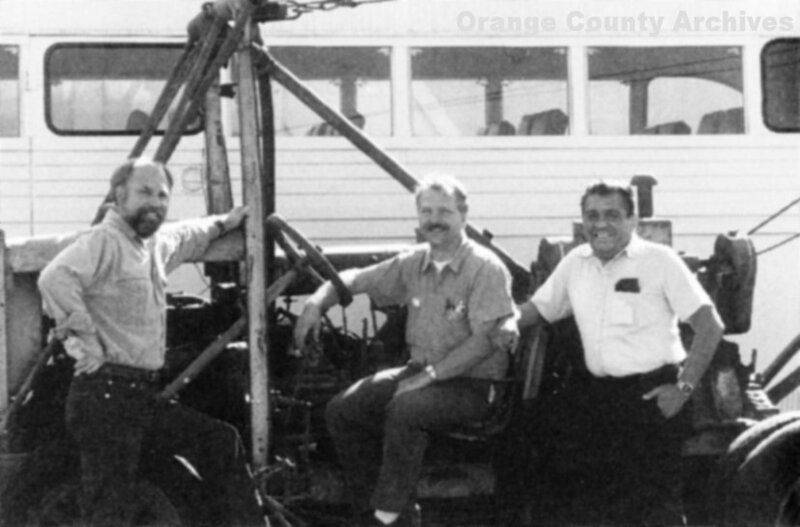 Field bought a Caterpillar crawler tractor and began to deconstruct and rebuild it to match his vision. He modeled his machine after a boot jack. 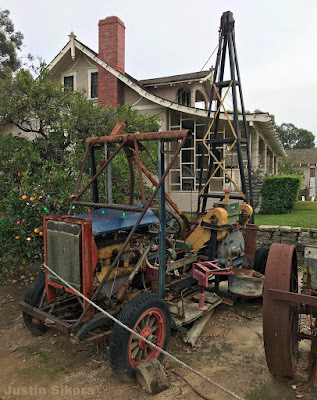 To the tractor frame and engine he added a large V-shaped pulling implement, ten heavy cables, two huge “duck feet”, connecting gears, old car parts, wooden-spoked wheels, a transmission lock-out, and other bits and pieces. "Once the tree was caught within the steel V, the machine's approximately sixty-ton force lifted it straight up from the ground,” wrote Francesca Russello Ammon, in her book, Bulldozer: Demolition and Clearance of the Postwar Landscape. “Then the operator would use a shovel and chain to pull up any roots that had broken off during the process. Beginning in the late 1930s, Field applied his stump puller to the removal of trees damaged by disease, gophers, or frost in Orange, Los Angeles, and Riverside Counties. “The period after World War II offered even greater opportunities for his stump puller. 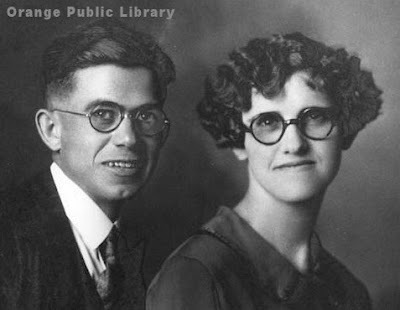 As Field recalled, ‘I pull the old seedling walnuts when they were taking out the walnut trees around here and putting in citrus. I pulled a lot of those with it. Then eventually I pulled the citrus trees out for houses.’"
The process, including uprooting, clean-up and grading the land, generally cost developers about a dollar per tree. The population boom of the 1950s and early 1960s saw the conversion of Orange County from a primarily agricultural area into suburbia. 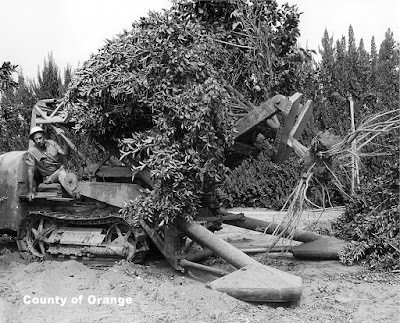 Driving this change was a high demand for housing, a disease called “quick decline” destroying orange groves, and new modes of tax assessment that punished farmers for farming. 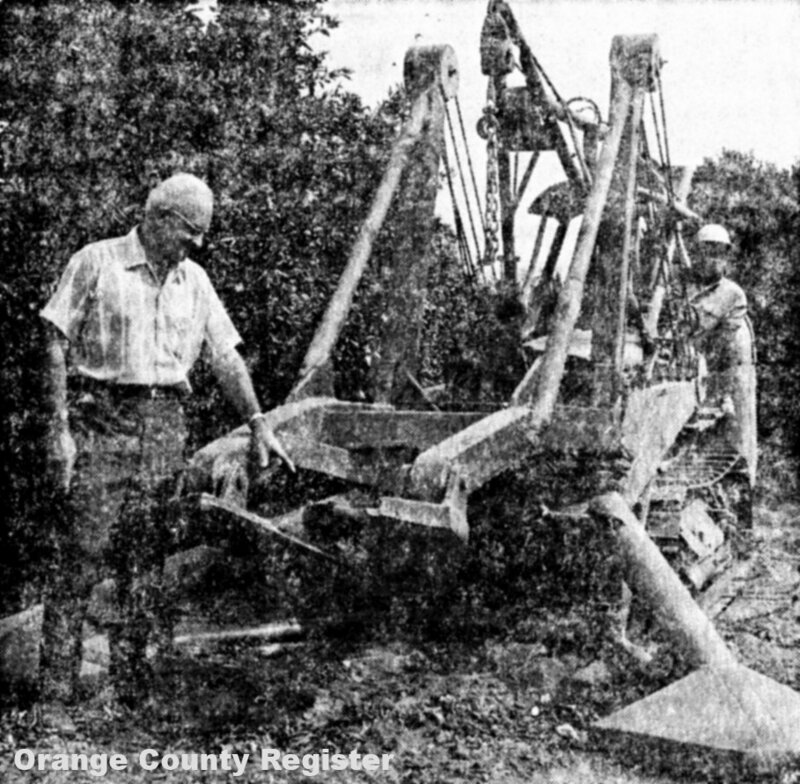 By the time Field retired, around 1963, he figured he’d torn out 350,000 trees with the machine – most of them citrus. 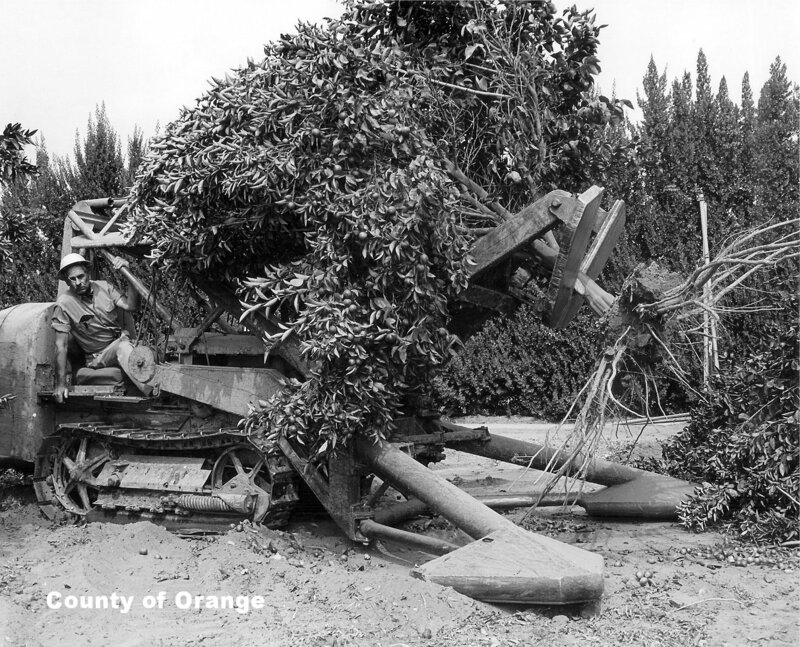 In 1970, Field brought the machine (and himself) out of retirement to remove experimental trees at the University of California’s South Coast Field Station in Santa Ana. It may have been used there for a number of years. Over the years, HB&P morphed into OC Parks, and officials with that agency, including the Historical Parks division, seemed to have no idea that they’d ever even owned such a device. Had the machine gone missing or sold for scrap? Or was it right under the nose of someone why just didn’t know what it was? Finally, in late 2018, during a visit to the Orange County Archives, OC Parks Historic Resource Specialist Justin Sikora mentioned a similar machine that was stashed around the corner from the old Bennett House at the County’s Heritage Hill Historical Park in Lake Forest. A few days later, he sent a photo of the machine. At first, it seemed like a small version of a stump puller, but it turned out to be a hand-built deep well irrigation pump puller. In 1996, vintage tractor enthusiast Richard Walker was at an auction in Victorville, and took several photos of a “shopbuilt stump puller mounted on a Caterpillar 22 crawler tractor, designed and built by mechanical master Weldon Field, of Orange...” The stump puller was not part of the auction and seemed to belong to the collector of farm equipment on whose property the auction was being held. Was the machine donated to the County the same one seen in Victorville? We might need better photos of both to be sure. 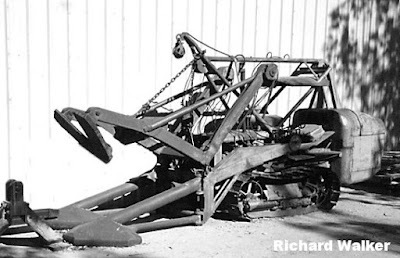 Walker writes, "Over the years Weldon fabricated several stump pullers on crawler tractors. The 22 was his last. I believe a previous version was built on an earlier Cat 30."